We’ve overhauled the orders listings page (here) to give you more power and more info. Now you can filter on more fields specifically, which lets us perform faster searches. We’ll break them down in a minute. In addition, on relevant search fields, you can also filter your results even further. Let’s cover the filters first, because they can apply to many fields. Pretty obvious here. We default to selecting both. Here you’ll see what marketplaces are relevant for you. If you only sell on Amazon.com then it will be the only thing in here. NOTE: In this section (and in other subsections), choosing none is the same as choosing all. We default to all except canceled. Blacklist – you’ve set this customer to never receive another email from you. *: For this to work you need to be forwarding your emails from Amazon to us. Please read this article about it. 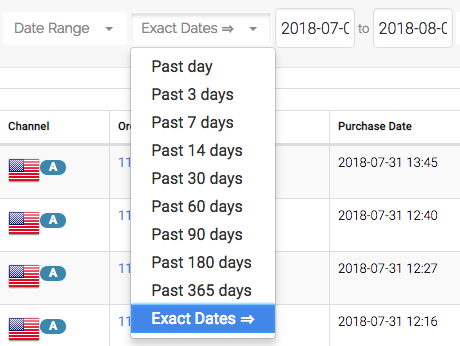 With Date Range selected in the first drop down, you are given a variety of options to choose from in the next drop down. Most, we hope, are self explanatory. If you choose Exact Dates you are then given the choice to enter a date range. The format is YYYY-MM-DD. You can enter all or part of an order number here. E.g “113-4137396-0344548” or just “0344548” (or any part). Same as ASIN. You need to enter an ENTIRE SKU. 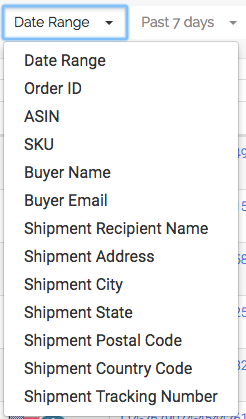 Enter all or part of the Buyer name or Amazon customer email address.